Cracks in a foundation wall or floor should usually be fixed. They can let in moisture, humidity, bugs, and, if left untreated, may become bigger as time goes on. Before a crack is repaired, however, you should try to determine what caused it and if it is a symptom of a larger problem. 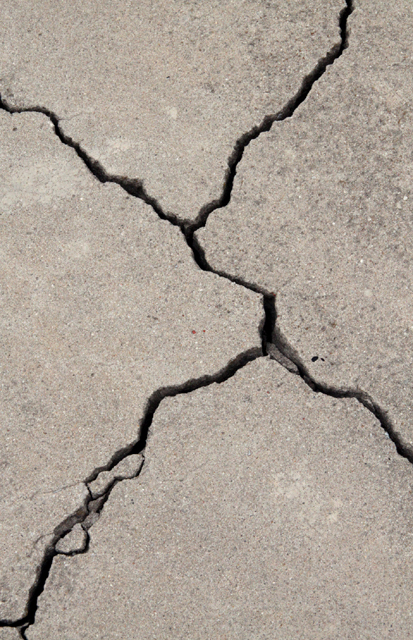 Minor cracks almost always occur as concrete dries and shrinks. Small cracks in concrete floors are common. Large cracks in walls are not. Even if you plan on fixing the crack yourself, you may be advised to have someone come to your house and check it out. When it comes to fixing the crack, you can either have a professional do it or do it yourself. When compared to some other do it yourself projects, filling a concrete crack isn’t that hard to do. On the other hand, like most things in life, if you have never done it before, you may not do the job as well as a professional would do it. And if you don’t do it right, you may end up not fixing the problem at all. If you have a poured-in-place residential basement, there may be a fairly fast fix available by using a commercially purchased injection system to fill up and seal those cracks. If you have masonry block foundation walls, the injection method won’t help you. The basic products and process that a commercial repairman or a homeowner will go through is pretty much the same. They will use a low-pressure injection system to place a bonding material inside the crack. There are two main types of injection products — polyurethane and epoxy. Epoxy adhesives are strong and are the products to use for structural repairs. These products are usually made up of two different components that are mixed together immediately before the time of injection. If injected properly, Epoxy solutions can keep water from passing through a crack in some situations. The second product is Polyurethane foam. Polyurethane foam is not as strong as Epoxy and it is not designed to structurally support your foundation, but it can mostly seal cracks, help to keep water out and stop humid air and bugs from entering. Professionals will probably have these products in bulk, but do-it-yourself crack repair kits are also available for homeowners to purchase. The process starts with cleaning the crack and vacuuming out any loose bits, dust or dirt. The wall needs to be dry as well before any work is started. Short tubes are placed directly over the cracks at numerous points and securely bonded to the wall (except for the center opening which needs to stay open in order to provide access into the crack). The entire crack is then sealed, leaving only the inside of the tubes with access to the crack. The urethane or epoxy is then slowly injected into each tube, starting at the bottom of the wall. The goal is to fill up the entire crack with the repair material, from front to back and from bottom to top. After a couple of days, the tubes can be broken, grinded off or sawed off. Hopefully, the crack will be filled successfully. When the repair is done, the work is going to be very visible. It will be obvious that a repair was performed. These repairs often are effective, but they don’t always work. For example, it’s possible that the injected epoxy may simply ooze out of the crack on the opposite outside wall before it has a chance to harden. If the outside wall has an erosion problem where there is no surrounding soil to prevent the material from escaping, the epoxy may not fill the entire crack because it has leaked out. In a situation like this, using a quick-hardening, expandable foam may work better. An experienced contractor may be able to predict this situation and anticipate the best solution. The process for sealing cracks in your basement floor is basically the same as the wall repair process. Epoxies and polyurethanes can work well with sealing the cracks, stopping moisture and radon gas from entering a basement. Working on a floor is easier than a wall. Some homeowners will forego the use of the injector tubes and simply use gravity to assist them with filling up the voids in their floor. This is especially true when the homeowner has multiple long cracks and wants to complete the job as quickly as possible. If you have cracks in your basement you are worried about, it’s recommended you have a professional inspector come out and take a look. You can get their advice and then decide if you would like them to do the work or if you want to try it on your own.